The engine on a Boeing 737 passenger flight operated by Russia&apos;s Utair airlines from Moscow to Makhachkala has caught fire on the runway just before takeoff at Vnukovo airport. Passengers noticed a burst of flames outside the jet, and opened an emergency hatch to investigate, the Utair airline said. They reportedly exited the plane and walked out on to the right wing, but returned at the request of the crew. 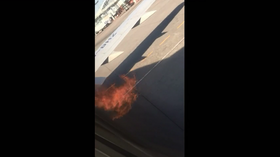 One passenger caught footage of the flames. The airline said the malfunction was caused by an interruption of airflow. “The situation is regular, the plane is fully operational, nothing threatened the passengers,” airline officials said, but added they would use another plane for the flight to Makhachkala. Published on Wed, 17 Apr 2019 17:26:00 GMT, © All rights reserved by the publisher.